Island Air -- the first major casualty of the interisland fare war created by newcomer go! -- is laying off and furloughing about 65 full-time employees, removing two aircraft from service and eliminating five routes. » About 65 full-time employees were laid off and furloughed on Thursday. » Two 37-seat de Havilland Dash-8 aircraft were removed from service but kept in the fleet as spares, leaving six planes that will be used. » The number of daily flights was reduced to 75 from 103. » The five eliminated routes are Honolulu-Lihue, Kona-Lihue, Kahului-Kapalua, Kapalua-Lihue and Kapalua-Kona. The privately held carrier blamed go! yesterday for the restructuring and said it was making the move to adapt to a changed marketplace. Island Air said the round-trip routes it is eliminating are Honolulu-Lihue, Kona-Lihue, Kahului-Kapalua, Kapalua-Lihue and Kapalua-Kona. Passengers already booked on those routes will be accommodated and contacted by Island Air, the company said. "It is no secret that the market has become unstable with the addition of go!," Rob Mauracher, Island Air's chief executive, said in a statement. "Yield has been damaged throughout the marketplace, and we must take these proactive measures to ensure that we remain financially stable for the long term." The layoffs and furloughs were effective Thursday and included employees from all departments, including management. 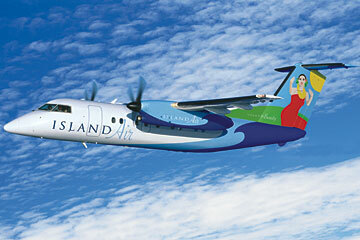 The 16 percent reduction left Island Air with 350 employees. Rumors had begun to swirl this week that the cutbacks were imminent. Charlie Willis, owner of Island Air's parent company, San Francisco-based Gavarnie Holding Inc., had been in town meeting with Mauracher, who has not returned repeated calls. Jimmy Rabino, the master executive council chairman of Island Air's pilots union, also could not be reached for comment. Mark Dunkerley, chief executive and president of Hawaiian Airlines, said it was just a matter of time before go! 's strategy took its toll. "This unfortunate development comes as no surprise to anyone," Dunkerley said. "Mesa's avowed strategy for go! to 'be the ones to give the last push' to competitors is bound to result in such casualties." Aloha Airlines, a former sister carrier to Island Air before it sold the airline to Gavarnie in 2004, declined to comment. Mauracher said in yesterday's statement that he wanted to emphasize that "these were not easy decisions for me and my team to make." "However, these adjustments were necessary to ensure we can continue to provide our customers with the quality service they have come to expect. I want to reassure our loyal consumers that we are here for the long haul." Jonathan Ornstein, chairman and chief executive of go! 's parent company, Mesa Air Group Inc., said Island Air needs to take responsibility for its own actions. "Price is the intersection of supply and demand," Ornstein said. "We added some capacity, and Aloha and Hawaiian added more capacity, and Island Air has to take responsibility themselves because they added some capacity with larger aircraft, the Q400." In September, Island Air said it was taking its largest plane, a 78-seat Q400, out of service and postponing the delivery of two other Q400s for six months. Mauracher attributed that move to higher seat capacity that go! brought to the market, high fuel prices and fare wars that have drastically pulled down ticket prices, sometimes as low as $19 one way. A month later, Mauracher said Island Air had signed a letter of intent to conduct mainland operations with an undisclosed party using the three Q400s. An Island Air spokeswoman said yesterday that she had no additional information about the fate of the planes or the potential mainland deal. Sources said at the time that Island Air was planning to base its mainland venture out of Las Vegas. Island Air, which flies 37-seat de Havilland Dash-8s, will now use six aircraft in its Hawaii service, with one of those planes being used part time. The two Dash-8s being removed from service will stay in the fleet but remain as spares. Before the restructuring, Island Air had the same eight aircraft in its fleet but was using only one as a spare. The carrier will continue to serve Hawaii's eight major airports and offer 12 routes with 75 daily flights, down from 103 flights. Ornstein said he was surprised that go! was being made a scapegoat for Island Air's restructuring. "I'm sorry to hear that four of the five routes we don't even serve are going to lose service, and the impact on the employees and the community is unfortunate," he said. "But I'm not sure how we can be the blame for the reduction of service in markets we don't even serve. "The fact is they had a nice niche business, and they avoided competing head-on with Aloha and Hawaiian. Then they went out of their niche and expanded before we even announced we were coming to Hawaii."